Julie Morgenstern CD and MP3 – Discount! 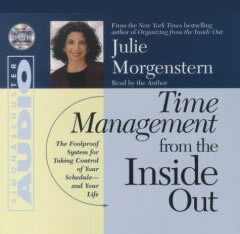 Professional organizer, Julie Morgenstern, teaches how to break through the clutter and manage your time with her clear, easy-to-follow guides. These days, we face no greater challenge in our personal and professional lives than organizing and managing our time. Conquer the clutter in your life and learn how to overcome the time challenge once and for all. This groundbreaking “inside-out” approach helps you uncover your psychological strengths and stumbling blocks to create a time management system that works and then stick to it! Stop procrastinating and take control with Julie Morgenstern.